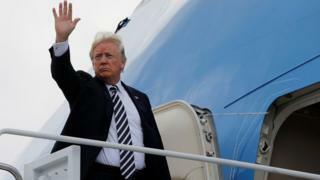 US President Donald Trump’s November visit to the Republic of Ireland has been cancelled. An Irish government spokesman said the trip had been “postponed for scheduling reasons”. Mr Trump was expected to visit his golf course in Doonbeg, County Clare, and Dublin on the weekend of 10-11 November. The office for Irish Prime Minister (Taoiseach) Leo Varadkar confirmed the November visit was cancelled and said the “US side has cited scheduling reasons”. Mr Trump is due to travel to Paris on 11 November for commemorations marking the 100th anniversary of the armistice that ended World War One. His visit to Ireland was to coincide with that trip. It is not known if he will still travel to France. Politicians and activists in Ireland had indicated they would hold protests during Mr Trump’s visit. Brendan Howlin, the leader of the Labour Party in the Republic of Ireland, said that Mr Trump was “no friend of democracy or human rights”. The Green Party had called on the Irish government to cancel the visit. The US president owns a golf resort in County Clare, Trump Doonbeg, which he bought in February 2014. He last visited Doonbeg in May 2014 and was due to visit again a few months before the US presidential election, in the summer of 2016, but later shelved the plan. Taoiseach Leo Varadkar invited Mr Trump to Ireland during a meeting at the St Patrick’s Day celebrations in Washington in March. In 2017, Mr Varadkar’s predecessor, Enda Kenny, also extended an offer for the US president to come and visit.